Jaguars defensive end Yannick Ngakoue is a pro’s pro — focused, driven and never in need of outside motivation. He is everything a franchise could hope for in a star player. Ngakoue is also massively underpaid and has yet to make huge money in the NFL. His wait will probably continue. Ngakoue has overperformed on his rookie contract (four years, $3.5 million) since being selected in the third round of the 2016 NFL Draft. The former Maryland standout has recorded 30 ½ career sacks (counting playoffs) with 11 forced fumbles. The 24-year-old Ngakoue is entering the final year of his rookie contract. Defensive ends like Dallas’ DeMarcus Lawrence and Detroit’s Trey Flowers just signed lucrative deals setting the market for Ngakoue. The problem is the Jaguars don’t appear to have the salary-cap space to extend Ngakoue. They have an estimated $15 million in space, according to spotrac.com, but still need to allocate roughly $8.5 to signing their upcoming draft class. Cap hits can be lessened in the first year of a contract. New starting quarterback Nick Foles signed a four-year, $88-million contract in March but counts for just $12 million on the cap this season. Still, it’s hard to see how the Jaguars could give Ngakoue the extension he deserves. Which begs this question. 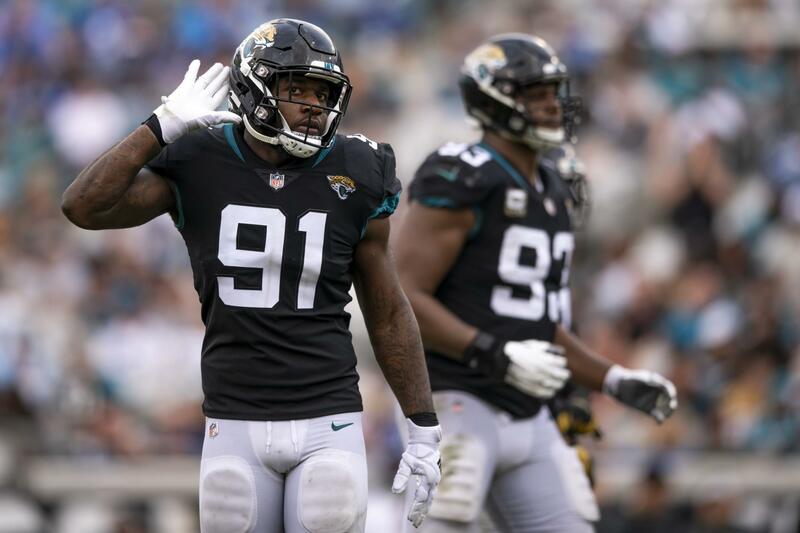 Will Ngakoue participate in the voluntary off-season program that starts Monday? Jaguars coach Doug Marrone emphasized 100-percent participation in the off-season program in his final team meeting on Dec. 31 a day after the 5-11 season ended. Cornerback Jalen Ramsey has a financial reason to stay away as he is deserving of a new deal and he’s already pocketed $19.5 million in career earnings. Ngakoue absolutely should skip out. He’s just not wired that way. Ngakoue’s love for football is arguably unmatched in the Jaguars locker room. If anyone can block out the distraction, it’s Ngakoue. But, it’s a big distraction. Lawrence is 26 and already has undergone two major back surgeries. He signed a five-year, $105-million contract with $65-million guaranteed that came with a $25-million signing bonus. In his five-year career counting the playoffs, Lawrence has 36 sacks and 10 forced fumbles. Flowers left New England in free agency and signed with the Lions. The five-year deal is worth $90 million ($56-million guaranteed) with a $28-million signing bonus. The 25-year-old Flowers has 26 ½ career sacks (counting playoffs) with five forced fumbles. Ngakoue is scheduled to make $2 million in salary this season. That ranks 52nd among defensive ends. Ngakoue would actually have incentive to hold out until Week 10 so that he can get the six-game credit for the accrued season, enabling him to be franchise tagged or become a free agent. Why play for a meager salary (by NFL standards) and risk serious injury when you are a year away from a gargantuan payday? Why put your financial life at risk because the team that drafted you botched the salary cap, largely by accumulating $16.5 million in dead money by cutting quarterback Blake Bortles? The Jaguars would have no one but themselves to blame if they can’t extend Ngakoue this summer and he elects to sit out the first 10 games. Fortunately for the Jaguars, Ngakoue likely wouldn’t even entertain such an idea from his agent. He’s wired to play football. He’s driven to maximize his talent. That’s all that seems to matter to this unique star.